Hello & welcome to #TuesdayTreats! I mentioned yesterday that it’s my cousin’s wedding this weekend, so this has inspired today’s theme. As the wedding season is upon us, today I’m featuring 5 wedding gift ideas… for those who prefer not to buy from the couple’s list. Playnation Champagne Flutes from @johnlewisretail – Why not select a mix of pink, blue & green flutes @ £36 for 6. White Candelabra from @RockettStGeorge – Made in powder coated metal with 5 arms with white candles included @ £39. Cakes & Heaven Blue Floral & Bird Pip Plates 3 Tier Cake Stand – With choice of vintage centre fitting @ £55. Susie Watson Strawberry Large Salad Bowl from @AmaraUK – Handmade beautiful pottery & choice of other designs @ £85. Personalised Vintage Wedding Typographic Art by @MoreThanWordArt from @notonthehighst – Truly unique gift @ £115. 5 wonderful wedding gift ideas for the happy couple (while showing off your style) but which will top the list in today’s #GTopSpot? 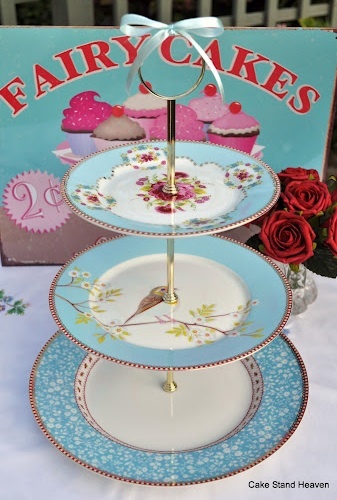 Today’s #TuesdayTreats #GTopSpot goes to #3 Cakes & Heaven Blue Floral & Bird Pip Plates 3 Tier Cake Stand – Simply divine! Previous ArticleEdina! Scotia’s darling seat!